In a medium saucepan, combine the water and sugar. Bring to boiling, stirring to dissolve sugar; reduce heat. Simmer, covered, for 5 minutes. Remove saucepan from heat. Add tea bags; cover and let stand for 5 minutes. Discard tea bags. Add the frozen peaches to tea mixture in the saucepan. Return to boiling; reduce heat. Simmer, uncovered, about 2 minutes or just until peaches are tender. Transfer the peach mixture to a medium bowl. 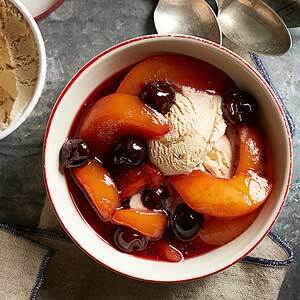 Stir in the frozen cherries and brandy. Cool slightly before serving, or cover and chill for at least 6 hours or overnight. Serve over ice cream or cake, garnished with toasted coconut or pecans, if desired.